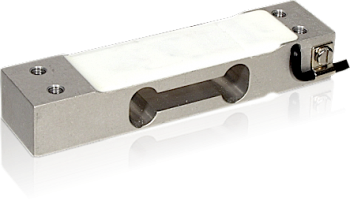 The load cell 1022 is a relatively new platform load cell which has rapidly become established as an industry standard where both a low profile and high accuracy are required. The low price and extraordinary precision of this model means that it can be used in a wide rang of inexpensive platforms such as counting scales and gas & oxygen bottle weighing. This load cell is also well proven in industrial filling and dosing processes, as well as medical and pharmaceutical process plants. The Model 1022 like many platform load cell, has a dual beam mechanical design. Each load cell is manufactured using an optimised complex machining process. This ensures that there will be no measurement error when the load is placed off centre, eg in a corner of a platform. The 1022 platform load cell can be supplied with an optional ATEX II 2G EEx ia IIC T4 certificate for use in hazardous gas areas – Zone 1 & 2. The 1022 load cell is fitted with a 4 core shielded cable as standard. Special cables and lengths are available on request.